Sometimes, I really just want a few slices of good ol’ pizza from a pizza parlor. 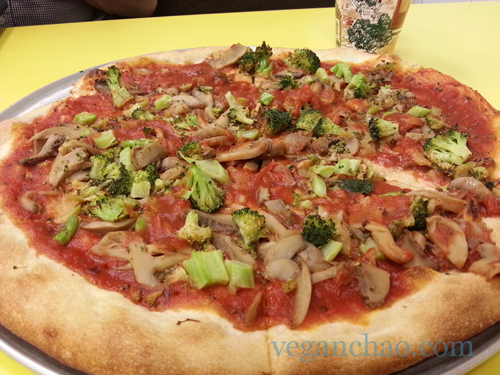 Yesterday, I went to X-tra Cheese Pizza in Flushing and was happy to find out that they had a vegan pie I could devour, all without really needing to mention that I am indeed vegan (the term can be a bit confusing, I have to admit). Just say “cheeseless” and the deed is done! I liked the old-timey style decor (though admittedly, I doubt they did that on purpose— this place seems to be pretty old… their website proclaims that they’ve been around for 20 years) and cheery yellow booth tables, as well as the colorful handpainted mural on the right wall. The overall ambiance was very homely and cozy, just like what a local, longtime neighborhood pizza parlor should be like. Digging the yellow tabletops and checkers! You don't see many murals like these anymore! And just a little warning: the bathroom in the back looks like a janitor’s closet, so I would recommend you go to the Burger King nearby if you absolutely need to. I first called in to see if they had anything I could eat on the menu, since the walk over was quite a ways from my current location– and I was greeted by a very jovial sounding man (who is named Joe, as I found out later on their site). 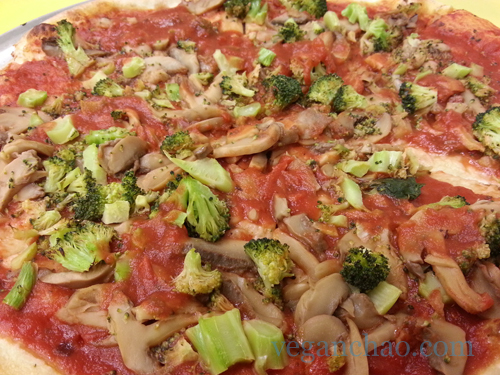 He assured me that they could indeed create a cheeseless, meatless pie for me, so I headed over, pizza craving in hand! Upon arrival, I found out their website is grossly outdated, as a worker informed me that their personal pie was no longer $5.75 but actually $7.00, without any toppings. 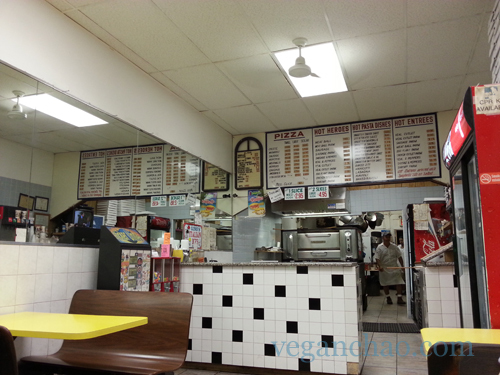 It’s still a good site, as it has pictures of the staff and their restaurant… plus, it looks retro! For the price, the size is pretty darn good! Look at all those fresh veggies and zesty sauce! I ordered the personal pie, with my choice of two toppings: broccoli and mushrooms. The sauce wasn’t too much: it had nice, chunky bits of tomato and went nicely with my other two toppings. The crust was crispy yet filling… it helped that they made my pie to order. I really enjoyed my pie, and thought it was a good size for the price: $7.00 for the pie + $1.00 for each of my additional toppings = $9.00 for a six slice pie. I actually had three slices leftover, yum! 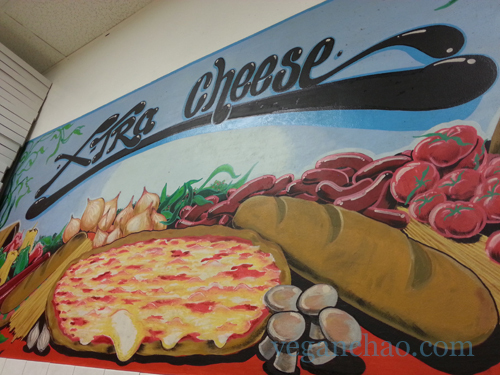 Overall, if you’re ever in the Korean part of Flushing, I’d highly recommend a little reststop at Xtra Cheese. 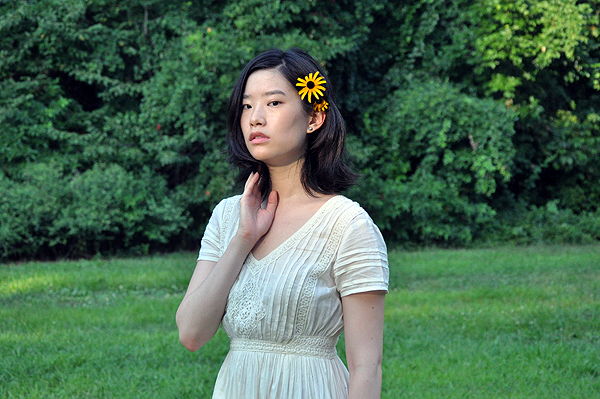 Don’t forget to visit Hmart to get some yummy vegan ice pops! 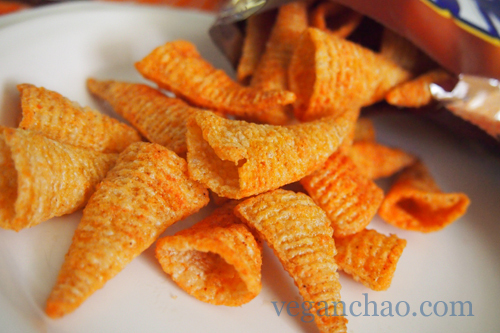 Hot Buffalo Bugles, Crunchy Fun!